The secret to the very best zucchini bread that is moist and has perfect texture is to add a little banana. 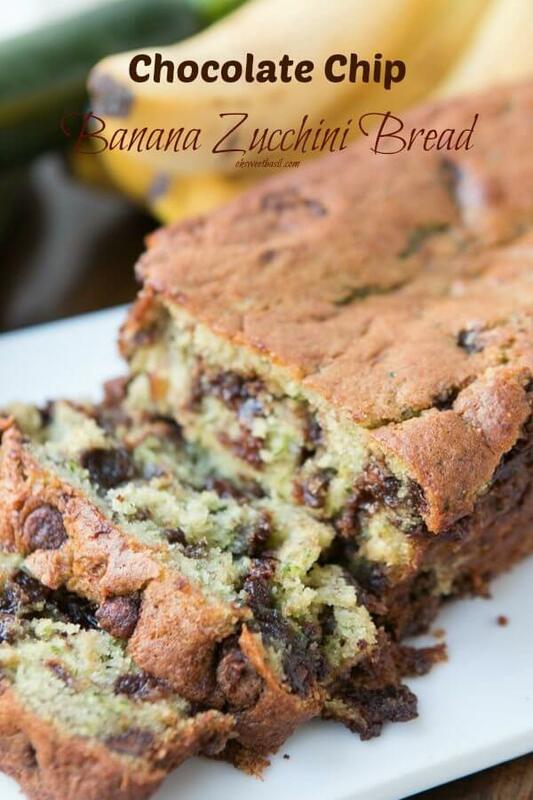 Chocolate chip banana zucchini bread for the win! Does Banana Zucchini Bread Need to be Refrigerated? To maximize the shelf life of banana zucchini bread, cover with foil or plastic wrap or place in a plastic bag to prevent drying out. Properly stored, freshly baked banana zucchini bread will last for about 1 to 2 days at normal room temperature. Did you ever play school when you were growing up? I totally did and I was pretty darn sure I was going to grow up to be a teacher. I didn’t. But I did grow up to be a banana bread lover. Not sure what that has to do with being a teacher, but it’s the truth. 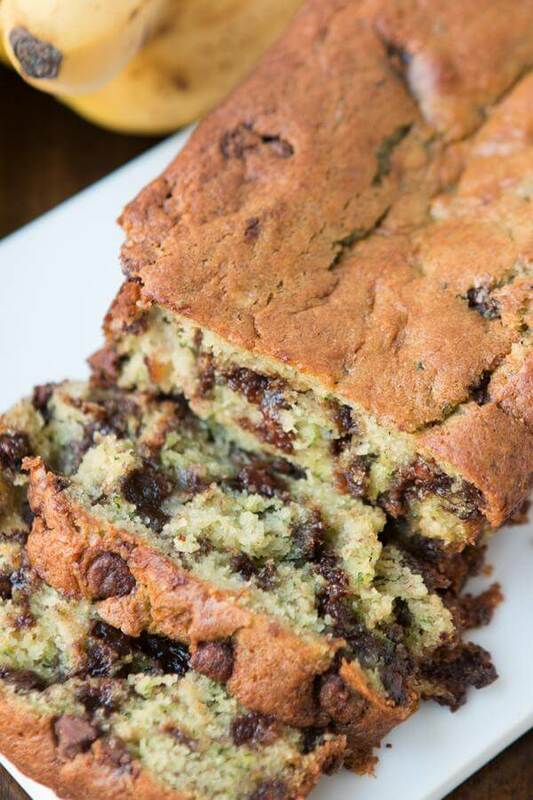 And now I shall tell you about this chocolate chip banana zucchini bread. 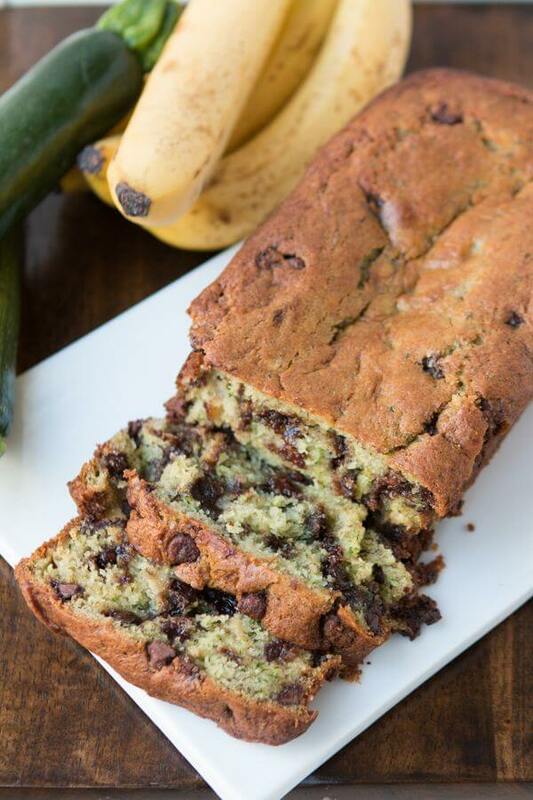 Can Chocolate Chip Banana Zucchini Bread be Frozen? Zucchini bread and Banana Bread definitely freezes well. It can remain frozen for two to three months if properly wrapped. I would suggest that you double-wrap it tightly in plastic wrap, then in foil. When you decide to thaw the bread, just remove the foil, but leave the plastic wrap on until it is completely thawed. Zucchini bread on the other hand, gross. I did not like the texture as a kid at all. I refused to eat it which must have been so much fun for my parents. And then I slowly forgot about it until I became a food blogger. If there’s one thing pinterest doesn’t need more of it’s quick bread recipes, so obviously I chose to give you all one. Not true? Well, either way I decided it was high time I tried this whole zucchini bread thing again and guess what, I was a total chicken about it. I mean, I couldn’t just jump in right? I’m a toe dipper in the pool for heaven’s sake! I needed a slow start so what better thing to try than a chocolate chip banana zucchini bread. And guess what? It’s so blasted delicious I’m going to try a zucchini bread tomorrow. All by myself. If I hate it I’ll give it away to the neighbors, ha! Why Does Banana Zucchini Bread Fall in the Middle? 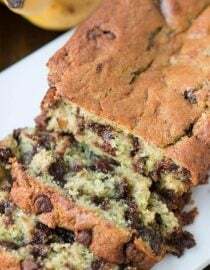 The most common reason for zucchini bread and other quick breads (and cakes) to collapse as they cool is the ingredients are too vigorously or quickly mixed, which incorporates lots of less stable air bubbles into the batter. As the bread or cake cooks, those air bubbles make it rise, but because they are unstable, the bread or cake then collapses as it sits. An excessive amount of baking powder in a banana or zucchini bread recipe can cause the dough to rise very quickly and then fall in the center when the resulting air pockets collapse. If you use baking powder or baking soda that has aged, it may lose effectiveness. Excess moisture or an inaccurate dry-goods measurement can cause the middle of your loaf to sink because the center of the bread is too moist and soft. Use bananas that are overripe and soft but not mushy. The softer bananas get, the higher the liquid content becomes. Add a tablespoon of flour at a time to help reduce the moisture of the batter, just until it is thick and not watery. Too much banana or zucchini can create a heavy loaf that may sink in the center. Follow the recipe to ensure that you add enough banana or zucchini without adding too much. To see exactly how to make this recipe just hit play! I think the big win came because the zucchini was grated so fine and oil was used instead of butter. I know! Don’t get crazy on me. I love butter more than anyone but oil really does make a better quick bread. It just does. I’m totally interested in trying this zucchini breakfast cookies recipe as well. Let me know if you did! In a medium bowl, whisk together the flour, baking soda, baking powder, cream of tartar, and salt. In the bowl of a mixer, add the canola oil and sugar. 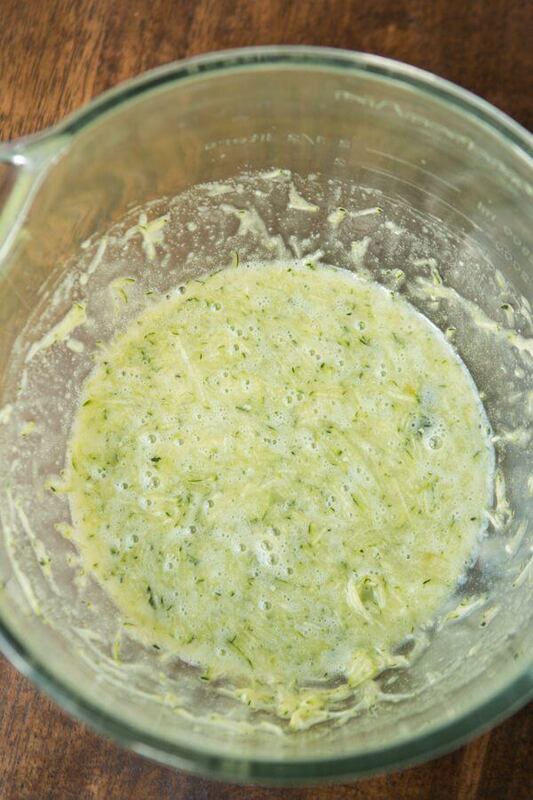 Dump in the zucchini and mix on medium speed until everything is evenly combined. Starting and ending with the flour, add a little flour while the mixer is running on low. Next add a little mashed banana and continue to alternate until the last of the flour is added. Fold in the chocolate chips and pour into a greased bread pan. Lighter pans provide better results than the dark pans. Bake at 350 for 50-55 minutes, tenting with foil the last 15 minutes to avoid too much browning. Allow to cool before slicing then serve warmed up with a little butter. 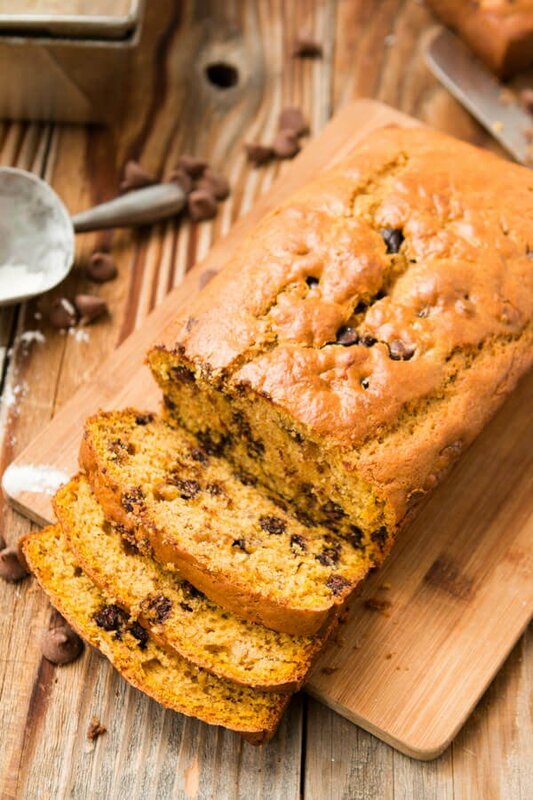 It’s totally a pumpkin bread but the addition of banana makes it perfectly moist! The addition of cinnamon chips is amazing! Can I omit the cream of tartar? Hello… not sure if I read that right… it is 4, 210 calories and 195 grams of fat per serving? Or is that for the whole loaf? Thank you for your response! 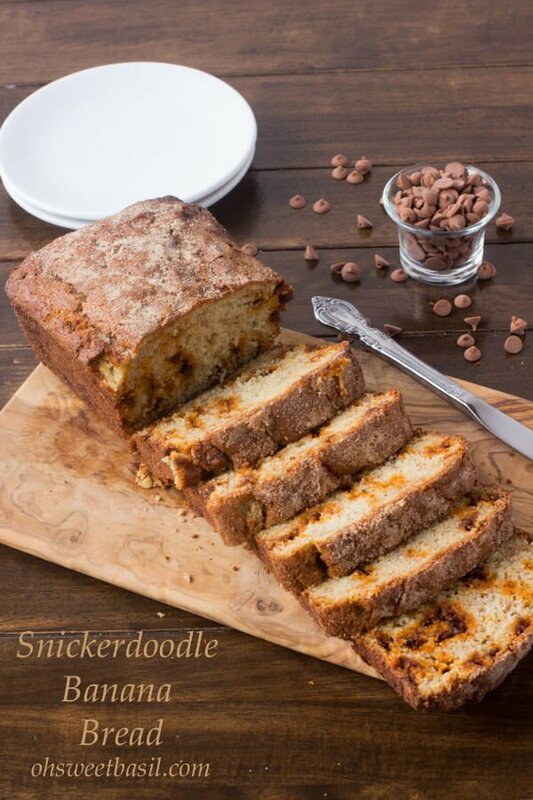 Whole loaf…it makes it about 300 calories per serving depending on how thick you slice them. Thank you so much Angie. I am always subbing in whole wheat flour and I need to remember to do a separate post on that as many are more hesitant about experimenting. Glad you did it on your own. xoxo! Zucchini makes everything so moist! 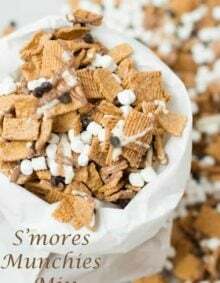 I bet this recipe is heavenly! This zucchini bread looks so moist and delicious! I love the addition of chocolate chips! My entire family LOVED this. I doubled the recipe, to make one with chocolate chips and one without. I also went half APF and half wheat flour. My kids never even noticed the difference! Isn’t it such a great recipe to use whole wheat flour in? Thanks so much for the review, xoxo! That melty butter and this chocolate chips together look amazing! I don’t like bananas. I was wondering what I can put in the place of them? I thought applesauce but is it too liquidy compared to bananas?? Any ideas??? Thank you. Hi Jen, You could use pumpkin but unfortunately everything else has quite a bit of excess liquid. You could always increase the zucchini amount and remove the banana completely. I baked for 1 hour and 10 minutes, and it still wasn’t done… just had to stick it back in because it was still runny in the middle. Common or is it because of how wet the zucchini is? We’ve made this enough time that I can tell you it’s definitely that you had a higher water content in your zucchini. Unfortunately that happens sometimes. If you notice a lot of liquid after grating the zucchini just make sure you squeeze it out in a towel first. I’m so sorry that happened, but I promise it’s worth making again. We adore this recipe. I make chocolate chip coconut zucchini bread/muffins. Oh, they are soooo good. This sounds wonderful also. ohhh, that sounds amazing! Do you use shredded coconut? If I make muffins instead, how long would you say to bake them? Hi Erica, usually 10-15 minutes depending on if you use a regular or large pan. 14 minutes for 12 regular sized muffins. I used Bob’s Red Mill gluten free baking flour, stevia instead of sugar and 1/4 cup canola oil 1/4 cup applesauce. 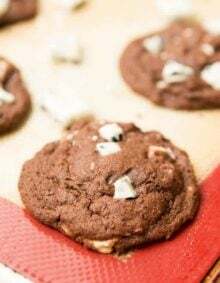 They are delicious, moist and fluffy and my kids LOVE them! Thanks for sharing. Just made this today! Doubled it in my KitchenAid…one loaf without choc for hubby and the other as is for me + the kiddos. I literally tossed ALL the ingredients into the mixer and mixed it one time only. Turned out PERFECT! Great recipe…pinning for next time since we have a thriving zucchini garden! It was delicious! I doubled the recipe and took a loaf to work where all of my coworkers also enjoyed it. Too bad I only had the one loaf! The other is for my family. Much praise! Sarah, thank you so much!! 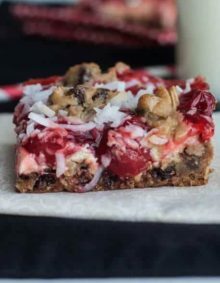 It really is one of my absolute most favorite recipes! Haha! I love it! How far along are you?